At present time the four-port approach to laparoscopic cholecystectomy is the gold standard treatment of gallstones. 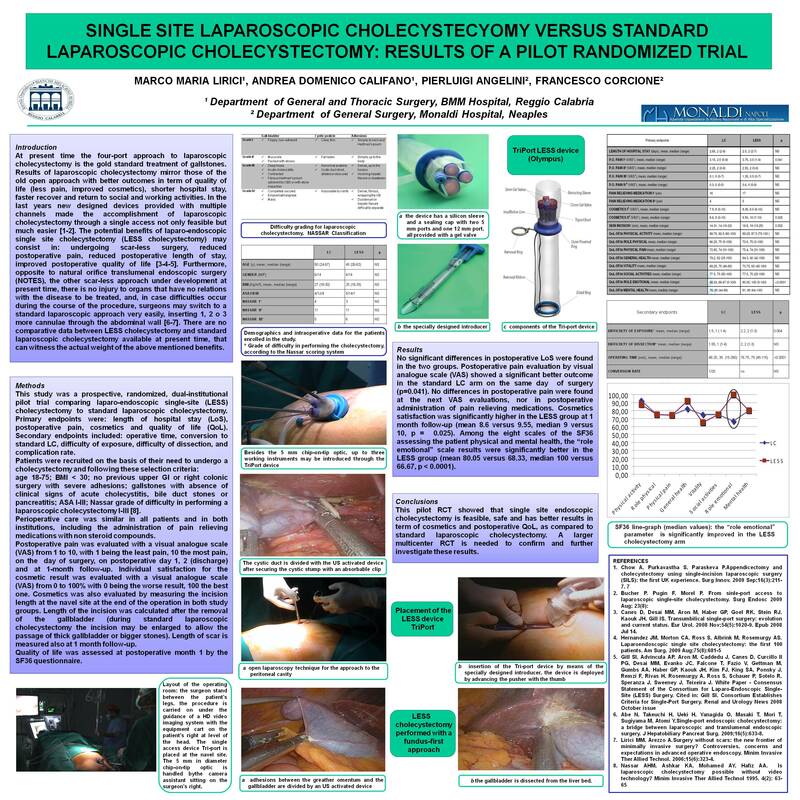 In the last 2 years new designed technologies made feasible the accomplishment of laparoscopic cholecystectomy through a single access. Such a scar-less procedure has several potential benefits (lesser pain, improved QoL, better cosmetics, reduced LoS) and almost none of the limits of the NOTES procedures. In order to evaluate the results of LESS cholecystectomy compared to standard laparoscopic cholecystectomy a pilot randomized trial has been accomplished in two high qualified centres for advanced laparoscopic surgery. Forty patients have been enrolled over a 3-month period. 1 month follow-upwas requested for the evaluation of postop pain, cosmetics and QoL. QoL was evaluated by the SF36 instrument. The patients were randomized in two arms: LESS Cholecystectomy 20 pts, Standard cholecystectomy 20 pts. Primary endpoints were: postop pain, LoS, cosmetics, QoL. Secondary endpoints were: OP time, conversion rate, difficulty of dissection and exposure. Patients with BMI >30 and ASA>3 were not included in the study. The grade of difficulty of cholecystectomy was scored according to the Nassar classification. LESS cholecystectomy was accomplished through a specially designed device (Triport – Olympus) using either US dissection of HF dissection. Statistical analysis: data were collected and elaborated with dedicated software. P < .05 was considered significative. Table 1 shows demographics, table 2,3,and figure 1 show the results. The limited number of patients enrolled gives small power to the randomized trial. OP time was significantly higher in the LESS arm, The role emotional parameter of SF36 was significantly decreased in the standard lapchole arm, other differences between the two arms were not significant. LESS cholecystectomy is feasible, safe and effective in selected cases. A larger phase3 multicenter RCT has been designed and started to further analyse the potential benefits of LESS cholecystectomy.